Regular aLearning blog readers have probably noticed a sudden drop in activity here. No worries! We’re fine. But we are involved in some other areas these days and providing up-to-date insight on association-related elearning topics hasn’t been at the top of the list, sorry to say. Previous posts on various topics continue to garner so many hits daily that the blog will sit, waiting and ready for new posts, when the time comes. 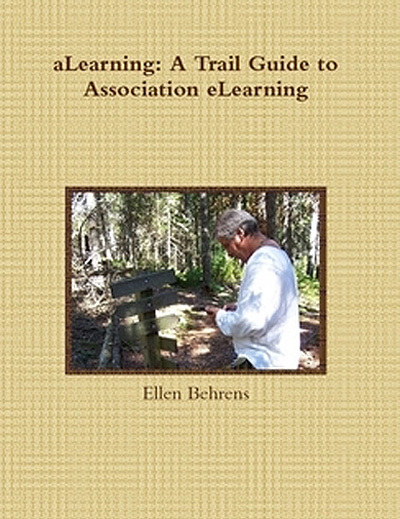 And the book aLearning: A Trail Guide to Association eLearning also continues to be available for purchase (in print, PDF, or e-book format) via http://www.lulu.com. Just click the image or button on the left for more information on how to order your copy. As ever, you’re welcome to send me an e-mail directly via the link on the left (below “Contact Ellen” on the left). You know I love data. You know I believe in the power it has to convince TPTB (The Powers That Be) in the need for elearning, for improved instructional design in face-to-face training, and all other related matters. We worry a lot about getting our data wrong and about the dissemination of incorrect information. But when’s the last time you worried that accurate data could lead you — or your association leaders or your members or your other constituents — in the wrong direction? Moral of Mr. Twain’s story? Use facts and data wisely. If you’re projecting the results of something, project something that’s realistic. If you’re drawing a causal relationship to examine what might have caused X, Y or Z to have happened, then do so logically. Accurate data, wielded irresponsibly, could be more disastrous than not having data at all. Remember that.